It’s pretty magical when a t-shirt design and specialty ink fall into perfect alignment. With all of the specialty printing we do around here, this occurrence is a lot less common than you might think. In a perfect world, the design allows the specialty ink to exemplify it’s capability while the technical aspects are executed effortlessly, like making a box of mac-n-chesse. When we reach this utopia, we step back, take a deep breath and nod our heads in silent confirmation. Yes. It’s perfect.Let’s take a little trip on the way back machine to around 2000, when high density printing was big on the t-shirt scene. High density ink is geared for a tall, square stack. It’s a simple as that. Why overcomplicate the beauty of the application with large, heavy complex t-shirt design that isn't very comfortable to wear? 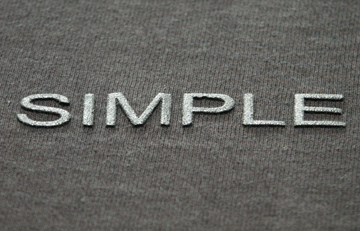 The Simple Shirt was born. Sans serif and small, the SIMPLE print stacked high and impressed. In my humble opinion, it’s the best example of high density printing we’ve ever done. Back to present day. All-over printing is the new high density. Not a lot of shops are doing it, but man, everybody wants it. As with any specialty application, you gotta know when to hold ‘em and know when to fold ‘em. Just because you can print high density ink on any shirt doesn’t mean every design will have the desired effect or the shirt will be wearable. In the same respect, just because you can print any design all over a t-shirt doesn’t mean that every design will translate properly or produce a shirt that is comfortable to wear. The Chicago Shirt was born. 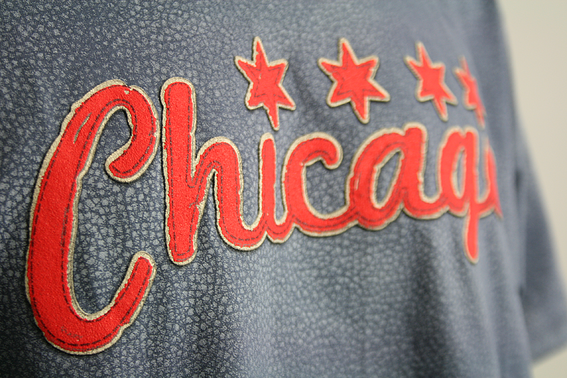 The Chicago Shirt is Sharprint utopia 2013. All-over printing and some newer dimensional inks used to put a contemporary spin on a timeless classic—the athletic tee. All-over printing has got to work with the shirt fabric. The best applications are usually tonal, textures, or patterns. All-over printing has a set of quality guidelines that come with printing over seams and collars that should be taken into account. The process does not allow for tight registration, so designs that work the best have flexibility when it comes to having the colors line up. 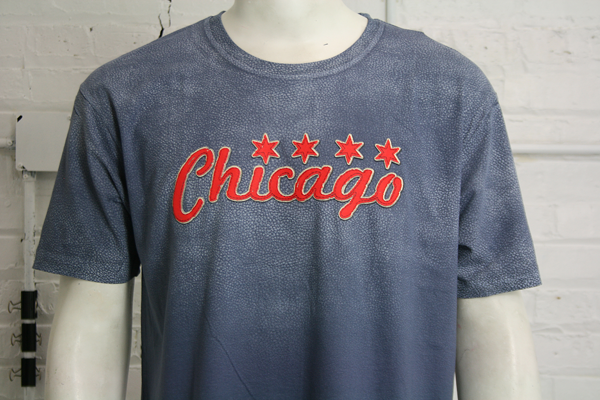 We used a chino white to print the all-over background on The Chicago Shirt. Chino base can be added to inks to make them softer. Once this shirt is washed, you can’t feel the background print at all. Why didn’t we use water-based instead of plastisol? Plastisol is easier to print, can have the same soft-hand, and these inks have a relatively equal environmental footprint to water-based inks. The distressed texture in the design eliminates the look of misprinting over collars and seams. We could have printed the texture all the way down the shirt and off the bottom, but the overall design is much more engaging and dynamic fading into the shirt. The ability to print all over a shirt is exciting, but a little restraint can make for a better product. For the faux athletic applique look, we used a couple of dimensional inks. Sculpture base for height and plush base for a little additional height and the nap texture associated with a leather patch. Dimensional printing calls for special screens to made using Phat Film and flashing, or heating, the ink on press prior to the final dryer run. If you are considering designing for or printing a specialty application for the first time, consult with an experienced printer in the earliest stage possible. Like mac-n-cheese, it’s going to turn out if you follow the recipe on the box. Some experimenting along with trial and error can create a unique flavor all your own. 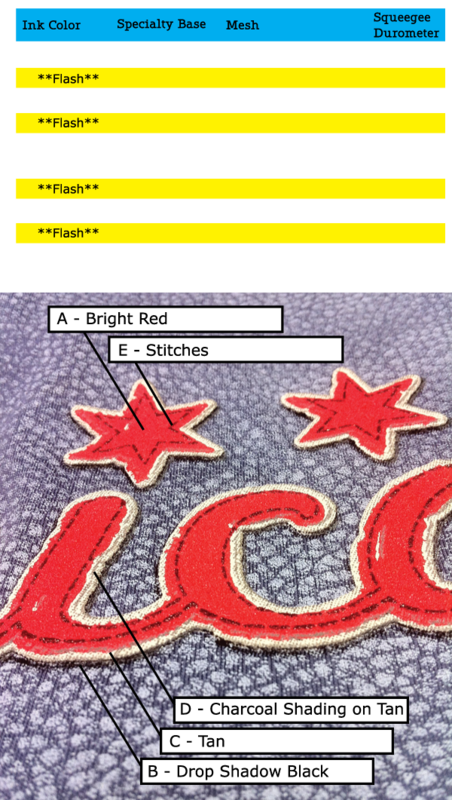 Here’s our recipe for The Chicago Shirt. Enjoy! Did you know we have a Resource Center with guides and free downloads developed specifically for the ASI/PPAI industry? We are constantly developing new tools, so visit the Resource Center often!